For some of us this is news worth passing up, for others of us this is proof that God answers prayers! I remember exactly where I was the first time I heard the epic, The Boy is Mine come blasting through my radio speakers. I was chilling on the front porch at my Grandma's on the West Side of Chicago listening to WCGI. I went crazy. I think the whole world went crazy! Two of the most talented and popular female r&b singers of that time coming together on 1 smash record in the same competitive energy in which people wanted to view them anyway= PERFECTION! The record written by the incredible Lashawn Daniels, Rodney Jerkins, and Fred Jerkins was catchy, fun, and all together a great production. The masses seemed to agree as the record..it spent 13 weeks at the top of Billboard 100 that Summer and continued to do well for months to come. With all of the great success many wondered if there was actually a rivalry between the two young stars. I must admit anytime I see Brandy or Monica tweet each other I get a little flutter in my heart! You know its just a song, but considering the similarity in their styles and career, one cant help but think that at some point they were rivals. 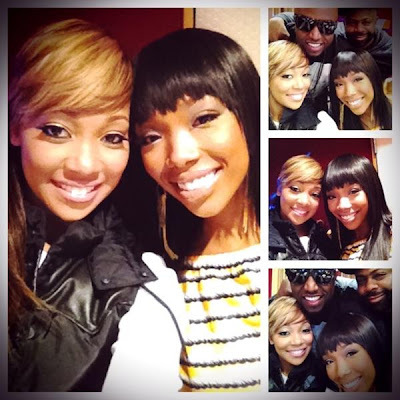 Maybe the above picture will put your minds at ease :) Brandy and Monica are in the studio again recording yet another duet and with the same crew who brought you the Boy is Mine plus Rico Love apparently-who is a hit machine right now! Im too excited to see what spin theyre going to take on the classic they've already done, or if they'll just give us another classic jam! Im SO excited! Monica tweeted the above picture with the words.. Followed immediately by Brandy with. I love you so much Mo❤thank u!